Just had a day full of learning and inspirations at GrowthHackers Conference 2017 in Los Angeles, and wanted to share my top 4 lessons with you. 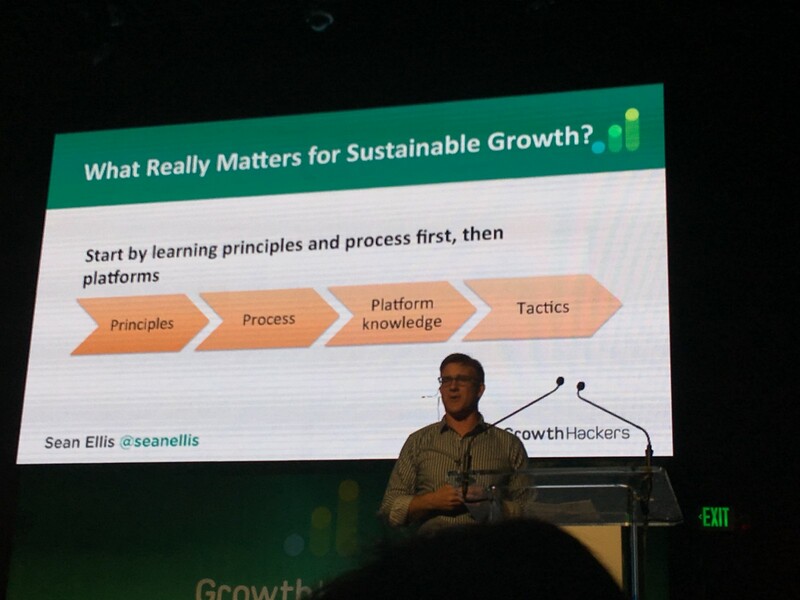 For those who are interested, I wrote a post about lessons from GrowthHackers Conference 2016, check it out here. If you tell someone you work on growth, you might still get questions like what is that? How is it different from marketing? Sean’s talk summarized it well. First of all, growth hacking is not just tricks and tactics or silver bullets: everything must be tested with clear hypothesis; Secondly, traditional marketing focus more on external channels, landing pages & emails, while growth-hacking test levers across whole customer journey; Finally, you don’t have to know how to code to be a growth hacker: dev skill is helpful but not critical, it can be acquired via including a developer in the growth team. So what is growth hacking? Growth hacking is rapid experimentation across full customer journey, and it starts from understanding growth principles such as Product Market Fit, North Star Metric and Growth Model, and following the growth testing process of ideation, prioritization, experimentation and analysis. Platform knowledge and growth tactics are important, but they come after principles and process. When Thibault Imbert from Adobe showed the slide below, the audience laughed. In reality, small startups may not have the resources to afford a big release like Adobe, but there will still be other projects and distractions. 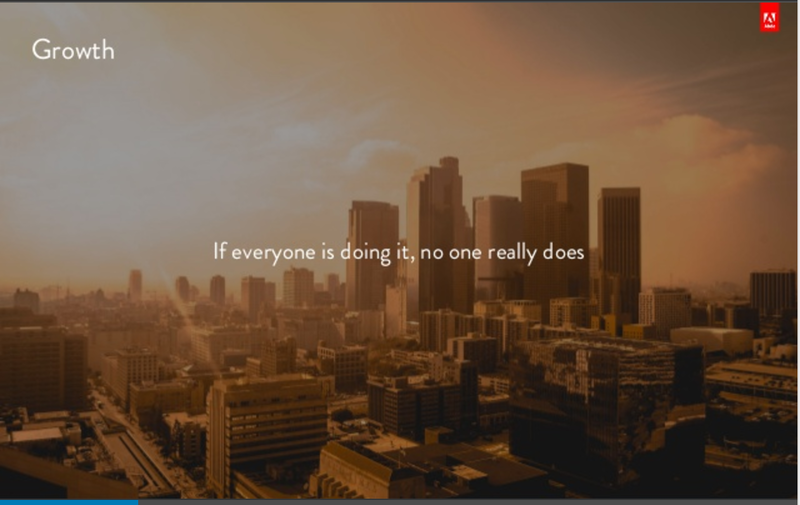 Thus, if everyone is doing Growth, no one really does. When there are competing priorities, if the team is not fully dedicated to growth, growth will be treated as a secondary priority, almost guaranteed. The really smart CEO and managers don’t allow that to happen. And the way to do it is to introduce a dedicated full-stack growth team, removing any externalities and ensuring the focus. Like Andy Johns mentioned in his First Round interview: when it comes to growth team, some people may ask “Do I really need this growth thing?” But think it this way, if you are serious about your business, you will for sure have a Finance team in charge of cash inflow and outflow, then doesn’t it also make sense for you to have a dedicated team to measure and improve the flow of users in and out of the product? That’s the role of a growth team. If you ask: isn’t growth everyone’s responsibility? You know what I will say: If everyone is doing it, no one really does. Lesson #3 Which project should you invest in first? If you have the luxury of working as a full funnel growth person (by full funnel, I mean from acquisition to activation to retention to referral), the growth opportunities seem to be all over the place. Which project should you invest in first? First of all, do you even ask yourself this question? If you don’t, please start asking yourself today. Because a shotgun approach is not a good way to grow, it will often lead to wasted efforts and no significant impact. 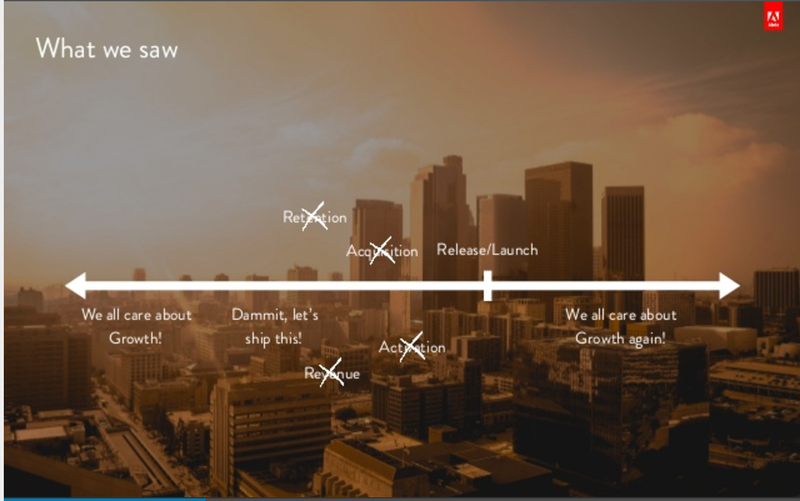 This is where a Growth Model can help: a simplified math model that can link all your growth levels such as acquisition and retention together, and rank each of your growth projects by its estimated impact. So, which project should you invest in first? 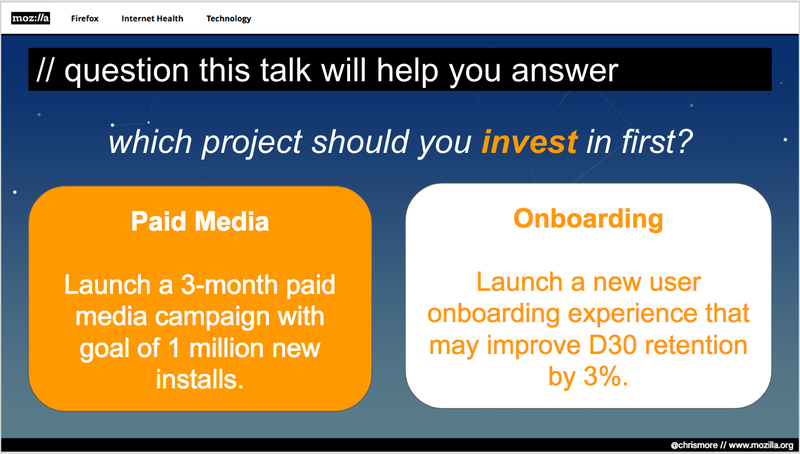 Hint: short-lived acquisition campaign declines quickly, while activation and retention improvement compound over time. He first pointed out the 3 common pitfalls of user onboarding: it’s often too long, it teaches too much UI, and it’s one size fits all. The window of opportunity, which is how much time you have before you lose a new user forever. The retention-correlated key user action, which can be found by comparing and contrasting the different behaviors and feature usage of churned and retained users. The new user experience should really be designed for activation & retention, rather than just set up. Don’t try to teach everything during registration, because education could be too premature when users don’t have enough context. 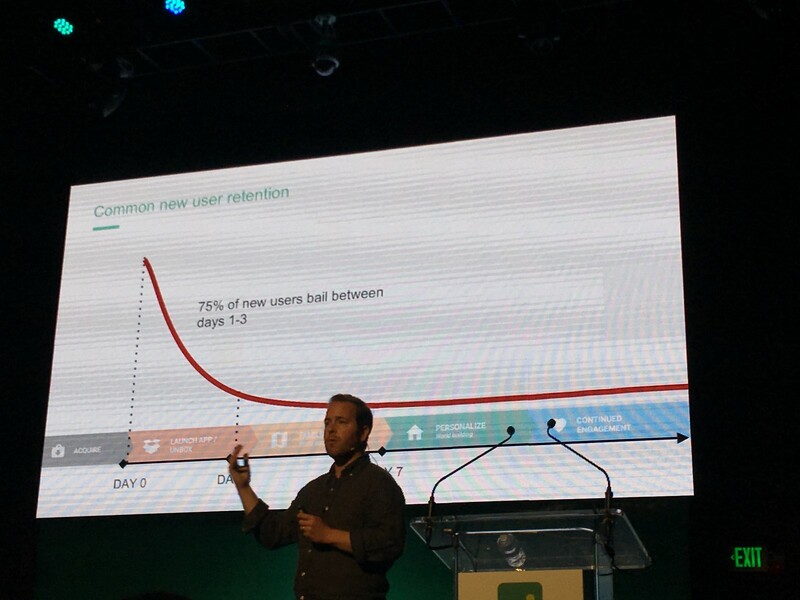 Drop users in UI as quickly as possible, and get them to take first key retention-correlated action. Then continuously onboard users to a more engaged states at a contextually-relevant moment. Instead of dropping users into UI to take first key action, isn’t it easier to guide users to do that in a more carefully designed onboarding flow? For example, as Sean’s “Hacking Growth” book mentioned, twitter’s new user Learn Flow really took advantage of new user’s high attention level, got users to commit to the service, experience the aha moment, and build stored value in just one visit. Does it matter whether user’s key action happens in app UI or in onboarding flow? When is a registration & onboarding flow considered too long? For example, the team at Drift added 6 more steps to their onboarding flow, and it worked better for them. If you can still get your users to take more actions, how do you know when you should stop adding steps?